After their monster mash showdown on the court, treats your athletes with some of these "spook"tacular Halloween treats! 1. Jack Skellington Macarons: Don't be afraid of these sweet treats. This treat is even gluten-free! Some almond flour, chocolate chips, white food coloring mixed with some sugar, salt, and granulated white sugar makes these delicious treats that all of your little ghosts and ghouls will enjoy! 2. Pumpkin Chocolate Chip Bread: It's not fall without a slice of pumpkin bread! This treat is perfect to bake during the fall weather. This gluten free option uses buckwheat bread, filled with fiber and great minerals making it a healthy sweet treat! Rather than filling their trick-or-treat bag with candy, your kids will be begging for a slice of this yummy treat instead! 3. Nutter Butter Boos: This is a very simple and fast treat to make! Purchase as many Nutter Butter packets as you would like to make, grab some white chocolate or almond bark, and chocolate chips. For easy convenience, put out the Nutter Butters on a cooling rack so you can easily spread the white chocolate onto your ghosts. Have the kids help decorate their ghost faces with the chocolate chips! Have fun creating and eating your "boo"tiful treats together! 4. Monster Munch Crunch: This crunchy treat is very sweet and easy to make. A delicious Halloween party snack filled with candy corn, M&M's, pretzels, and more. Coat over the top of your mix with melted white chocolate for a scrumptious finish and fill little good bags with your yummy mix. All of the trick-or-treaters will be flocking to your house! 5. 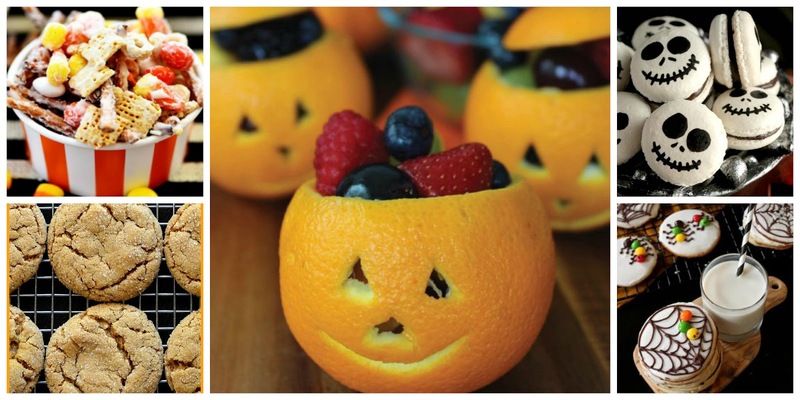 Jack-O-Lantern Fruit Cups: Grab a very healthy treat bowl instead of candy that will leave your kids' with stomach aches. Simply pick up some oranges, and cut out your Jack-O-Lantern face. Fill it up with some raspberries, kiwi, strawberries, pineapple, blueberries, or orange slices. This is a great treat the is loaded with vitamins for a healthier lifestyle and still sweet! 6. Vegan Pumpkin Ginger Cookies: There is nothing better than treats with a healthy twist, like these gluten-free fall cookies! One bite of that crispy outer layer with that soft chewy taste of pumpkin spice will leave your taste buds in awe. The pumpkin and ginger mixture is a must-have at every Halloween party! 7. Mummy Pumpkin Pastries: These mummies won't creep you out! Instead you will be eating them fast than you can wrap them! These twisted treats are quick and easy to make. Ingredients include pumpkin puree, cream cheese, sugar, cinnamon, and egg yolks. Once your little mummies have cooled off, give them a spooky face and enjoy! 8. Vegan Frosted Pumpkin Cookies: After having one of these cookies, you will be dancing the Monster Mash in no time! These tasty vegan treats are easy to make and something everyone can enjoy! 9. Vegan Creepy Crawly Sugar Cookies: Don't let these treats scary you! These eye-catching treats with have everyone grabbing one for their plate at the party. Made with light and fluffy dough, enjoy these vegan treats with smooth icing and spooky decorations to top them off! 10. English Muffin Halloween Pizza Mummies: This is a snack for your hungry guests that will keep them ready for Halloween fun. Use English muffins halves as your base for your Halloween pizza creations. Use an assortment of toppings to create mummies, vampires, and all sorts of spooky monsters! With these sweet and savory treats, you can create the ultimate menu of treats for your Halloween Party! For more treat ideas, check out our Pinterest Board!